Jul 21 About Those Medicare "Cuts"
"Barack Obama", "Medicare", "Medigap", "Professional Left", "health care costs", "health reform"
The pretend progressive freakout brigade has been out screaming about how President Obama is planning to "cut" Medicare and Social Security to balance the budget. The focus is more on Medicare. The other day, the lunatics at the PCCC (who think Paul Ryan is a better friend of Medicare than President Obama) took a whole 12 people to deliver threats - err, I mean petitions - that say its signatories won't volunteer for or donate to the President's re-election campaign, and they also claim to be previous Obama donors/volunteers/voters. Uh huh. Collapsed, eventually completely closing the Part D prescription drug donut hole. While the donut hole is being shrunk over time, seniors in that gap get a 50% discount. Medicare (Part B) recipients now have free preventive care, eliminating copays for them under the old system. The President has said that he is willing to do entitlement reform, Medicare reform specifically, to strengthen the program and ensure its financial viability. Let's look at what such an approach might look like. And so what we’ve said is a lot of the components of Bowles-Simpson we are willing to embrace -- for example, the domestic spending cuts that they recommend we’ve basically taken. 3.3.2 Reform Medicare cost-sharing rules. Currently, Medicare beneficiaries must navigate a hodge-podge of premiums, deductibles, and copays that offer neither spending predictability nor protection from catastrophic financial risk. Because cost-sharing for most medical services is low, the benefit structure encourages over-utilization of health care. In place of the current structure, the Commission recommends establishing a single combined annual deductible of $550 for Part A (hospital) and Part B (medical care), along with 20 percent uniform coinsurance on health spending above the deductible. We would also provide catastrophic protection for seniors by reducing the coinsurance rate to 5 percent after costs exceed $5,500 and capping total cost sharing at $7,500. 3.3.3 Restrict first-dollar coverage in Medicare supplemental insurance. The ability of Medicare cost-sharing to control costs – either under current law or as proposed above – is limited by the purchase of supplemental private insurance plans (Medigap plans) that piggyback on Medicare. Medigap plans cover much of the cost-sharing that could otherwise constrain over-utilization of care and reduce overall spending. This option would prohibit Medigap plans from covering the first $500 of an enrollee’s cost-sharing liabilities and limit coverage to 50 percent of the next $5,000 in Medicare cost-sharing. We also recommend similar treatment of TRICARE for Life, the Medigap policy for military retirees, which would save money both for that program and for Medicare, as well as similar treatment for federal retirees and for private employer-covered retirees. Look bad? Okay, let's tackle these one by one. First, cost sharing, the concept of a universal deductible and so forth. As anyone who is on Medicare knows, it already has a system of premiums, copays, and so forth, which should take away the pretense that any cost sharing at all is a "benefit cut" in Medicare. First of all, in the current Medicare system, there is no limit to one's out-of-pocket expenses. Let's see how Medicare works right now and how it compares and contrasts with what is being proposed by the Commission report. Here is how the Medicare Part A and B cost sharing currently works. 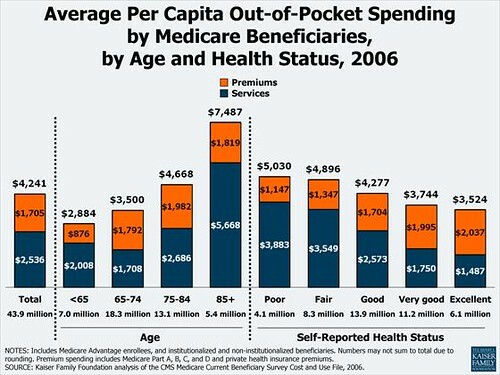 Here is Medicare's cost-sharing under the current system. 1 Each of the 60 reserve days may be used only once during an individual's lifetime. 2 73% of beneficiaries in this income category will not pay the increased premium. They will continue to pay the Part B premium they paid in 2010 ($110.50) or the premium they paid in 2009 ($96.40). The other 27% will pay the new amount. See the note in our section on Medicare Part B for more info. The distribution is obviously slanted more towards sicker people who pay a lot more in out of pocket expenses - 5% of Medicare recipients pay more than $5,000 a year in out-of-pocket costs account for 35% of total cost-sharing liability under Medicare (data from CMS). As you can see from the above chart, older seniors - who are also at the greatest risk of running out of their savings - have a much higher average out-of-pocket expenses. Because those with the highest costs are probably also the most struggling with their costs, a catastrophic cap ($7,500) should actually help those most in need. All in all, for the vast majority of people, in terms of benefits, these changes won't make that much of a difference. It is difficult to say exactly for whom the out-of-pocket expenses will increase or decrease, of course, since it will depend on the individual, their health conditions and habits, and the services they use. Medigap reform: Now, let's come to the changes proposed in the Medigap plans. Often called Medicare Supplement insurance, these plans cover expenses that Medicare won't, and/or only partially cover. What the Commission report is talking about is eliminating first dollar coverage - prohibiting Medigap plans from covering the first $500 and any more than 50% of the next $5,000 in Medicare cost-sharing. The rationale is that that coverage encourages overuse of medical services. It's important to remember that when we are talking about over-utilization, for the most part, we are not talking about "greedy" seniors who see their doctor "too much." No, we're talking about test-happy doctors and institutions, and for-profit device manufacturers fraudulently pushing "power-chairs" to people who do not need them, and overcharging for people who do. This is something I don't think most people having a cow every time someone talks about over-utilization understand. But even if one does not accept that argument - or is ideologically duty-bound not to accept that argument - here is one thing about Medigap: The average Medigap plan costs $2,329 in premiums per year, making sure only relatively well-off seniors can buy them. If anything, this reform saves costs on the end of physicians and medical facilities that who will be more careful about procedures and equipment to order, which might even improve, rather than degrade, quality of care by focusing on health and wellness and care and not as many procedures and equipment as can be paid for. In fact, A KFF study (which I will cover in detail later in another post) finds that even with these reforms, seniors on Medigap would pay less in Medigap premiums and cost-sharing than under the current system. As we discuss the future of Medicare, we also need to remember a critical reality: According to the latest Trustee report, Medicare's trust fund starts running a deficit in 2024. Without any reform, every single current Medicare recipient who plans on living at least another 13 years will get an automatic and immediate cut in benefits. So... yeah. I have got a better idea than "everybody freak out!" I think everyone should calm down, study the issue, learn something before they start going fever pitch. The reforms being proposed, along with the Affordable Care Act and further reforms in prescription drug and provider payment schedules, are actually substantive ideas that preserves and strengthens Medicare, and our health care system as a whole.